I recognize that all of these terms, which are code words for “mentally ill,” are in the vernacular. I do not want to serve as a politically correct mental health policeman, who censors everyone’s language. But I do think that words matter here and not per se for politically correct reasons. As everyone has noted by now, words certainly matter if we are to stop violent acts by angry, hateful people like the bomber, the shooter and the racist, who killed two African-Americans last week in a Kroger store in Kentucky, after he tried to enter a black church. Of course, none of this amped-up bullying and incendiary rhetoric is new to Trump. One need only recall that Trump, a candidate for president at the time, said that he could “stand in the middle of 5th Avenue and shoot somebody” and still get elected. Such irresponsible language from Trump and others clearly can provoke and incite angry, hateful people into committing violent acts. But, as I have stated before, angry, hateful people share little in common with the mentally ill, a group of individuals who, according to studies, are more likely to be the victims than the perpetrators of violent crime. This might sound counter-intuitive to some, but politicians and commentators need to realize that the mentally ill, like those with more visible disabilities, tend to be more vulnerable to acts of violence because we are perceived to be marginalized, otherized, different and weak. Just consider how casually Donald Trump used the word, “psycho,” to demean and malign President Obama during the Ebola crisis a few years ago. And consider the cruelty displayed by Trump when he mocked the disability of New York Times reporter Serge Kovaleski. People with disabilities, including mental illness, have often been bullied in our lives. The people who do the bullying and commit those violent acts tend to be white men with grievance issues. They often don’t have a regular job, don’t have much of an education, and don’t have a significant other. I was delighted to hear Casey Jordan, a criminologist and behavioral analyst, rebut Kate Bolduan on CNN, after the anchor, filling in last week for Erin Burnett on CNN’s “OutFront,” suggested that the pipe bomber was mentally ill.
“Not necessarily,” said Jordan, who quite thoughtfully pointed out that the bomber was an angry, hateful man who wanted to fill a void in his soul, and he did so by latching onto the angry, hateful rhetoric of Donald Trump. She added that the bomber, who told a co-worker that he was a Seminole Indian and a white supremacist, was very likely a pathological liar. That is a characteristic of a psychopath, and psychopaths are not to be confused with those of us who have a psychotic disorder. As I have pointed out numerous times before, psychosis simply means divorced from reality; there is zero implication that anyone with such a diagnosis is violent. Indeed, the mentally ill, who do not have substance abuse issues, commit only 3% to 4% of violent crime. Psychopaths, on the other hand, plan violent, hateful acts, for which they show no remorse, not unlike Iago, the villain in Othello. That was certainly true of the bomber, who had to assemble many parts, produce stickers with addresses on them, put postage on a dozen or so packages (and perhaps many more) and mail them to various Democratic leaders around the country, as well as CNN. That the suspect may have bungled the assembly of the pipe bomb and misspelled many names does not detract from the fact that he planned his cold-blooded series of crimes, carefully selecting targets, who had been singled out for hateful rhetoric by Trump. As for the shooter in Pittsburgh, he did not have to assemble a bomb. All he had to do was walk into the open door of the Tree of Life synagogue and fire his guns, including an AR-15, a military-style weapon, which he reportedly purchased legally. He may not have meticulously planned his operation as much as the bomber did, but the shooter had long espoused hateful views toward Jews, as had the bomber. 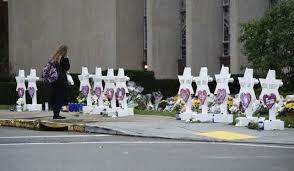 It is very eerie that, at press time, the number of worshipers killed at the Pittsburgh temple was 11, the same number of Israelis killed in Munich at the 1972 Summer Olympics. I was just a little boy when that act of hatred, that act of terrorism, took place. A year later, Arab armies attacked Israel on Yom Kippur, the holiest day of the year for Jews. That was the 1970s, and those dastardly attacks occurred overseas. I did not think that such brutal acts of cowardice could occur here in the U.S. in 2018. But I guess I was kidding myself. According to the Anti-Defamation League, anti-Semitic attacks increased by 57% last year, the single highest year-to-year increase in these bigoted crimes against Jews since the ADL began compiling statistics about 40 years ago. While the bomber was an ardent supporter of Trump, and the shooter criticized the commander-in-chief for his association with Jews, such as his daughter, Ivanka, and son-in-law, I would highly doubt that either suspect, just as I would highly doubt that the racist, who shot the two African-Americans in Kentucky, had an actual, diagnosable mental disorder. These men are hatemongers, filled with rage, who acted out on their evil and targeted individuals, Jews, blacks, the press and liberals, who had been otherized. The hideous behavior of the suspects, who are psychopaths, is a far cry from that of the mentally ill, who, like the targets in last week’s attacks, have been otherized and are more likely to be the victims than the perpetrators of violence.